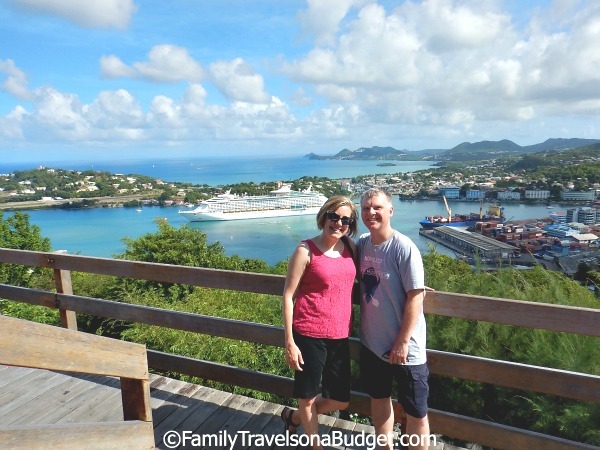 In October, Rob and I took a long anticipated cruise to the Southern Caribbean. There are so many stories to share, but none is as special as this one. It’s a story of love and adventure and dreams come true. Like any great story, though, there’s a twist…. a sudden plot twist with unexpected tragedy — and a hero to the rescue. Amazingly, the story is completely true! Intrigued? When planning our celebration getaway, my husband’s only request was time to relax. Easy enough — we were cruising WITHOUT the kids! My wishlist was a bit longer, but I trimmed my list to my top 5 wants so he’d have some relaxing time. 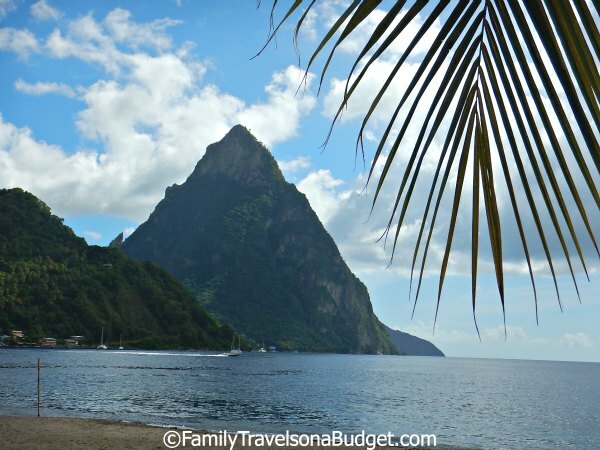 My top wish was to see the Pitons of St. Lucia, a UNESCO World Heritage Site. We booked a tour and counted down the days. As our vacation approached, the weather forecast for St. Lucia grew steadily worse — rain, rain, rain! I wasn’t sure I’d get to see them after all. BUT, the day arrived bright and sunny, with light puffy clouds across the sky. We got up early, headed off for a big breakfast, and then grabbed our bags — including my “good” camera! This was a dream come true! I needed photos — lots of photos. We chose independent tour operator, James Tours, for our St. Lucia excursion. James Tours came highly rated on TripAdvisor and on Cruise Critic. 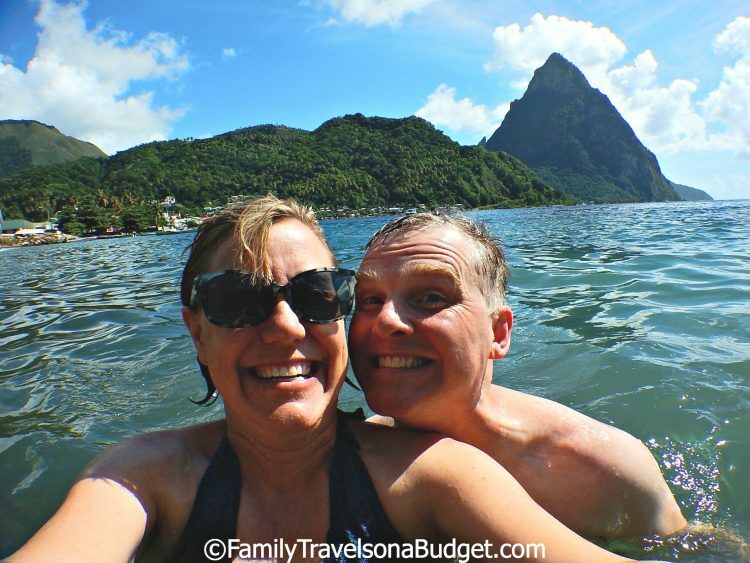 The tour far exceeded our expectations and I heartily recommend James Tours to anyone spending a day in St. Lucia! St. Lucia’s roads are quite narrow, typical in the Caribbean. There are loads of switchbacks throughout the hilly island, making driving difficult for those not familiar with it. I am glad James drove us rather than try to explore the island on our own. Our first stop provided a souvenir shopping opportunity and great views of our ship in port. We also stopped at a banana plantation to learn about the island’s banana industry and taste some local products made with banana. 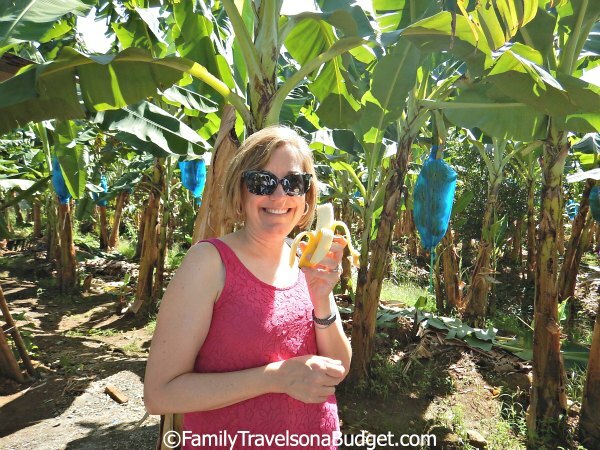 Yes, we even got to eat bananas fresh off the trees. 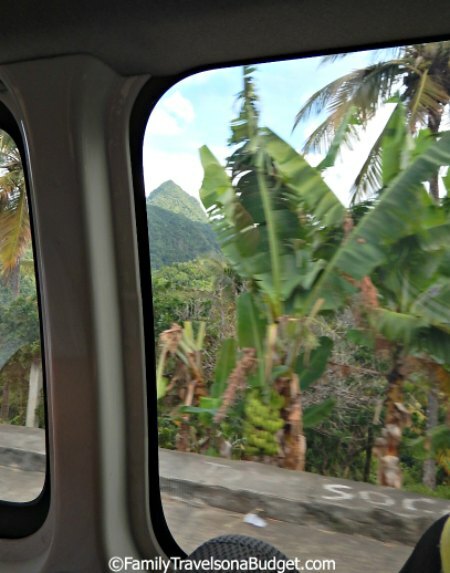 After climbing the mountain on St. Lucia’s zigzag roads, we rounded a bend and I caught my first glimpse of the Pitons. Moments later, James stopped the van so we could get out and take a few photos (or more than a few). So exciting! The Pitons are getting closer! Along the way, we enjoyed a traditional Caribbean lunch under a shaded canopy, with drinks and dessert. 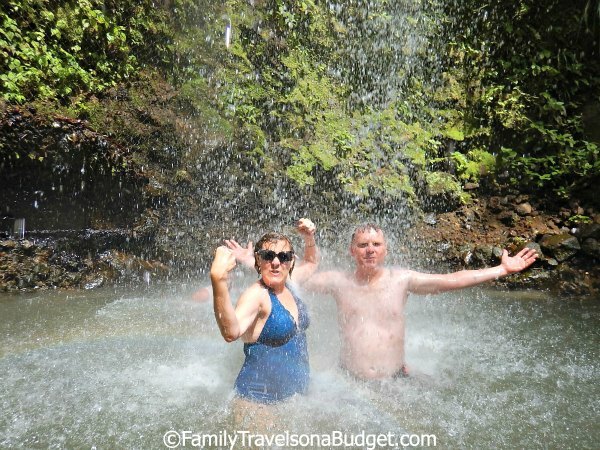 We stopped for a mud bath at Sulphur Springs, the world’s only “drive-in volcano” and then went to a waterfall for a quick dip. 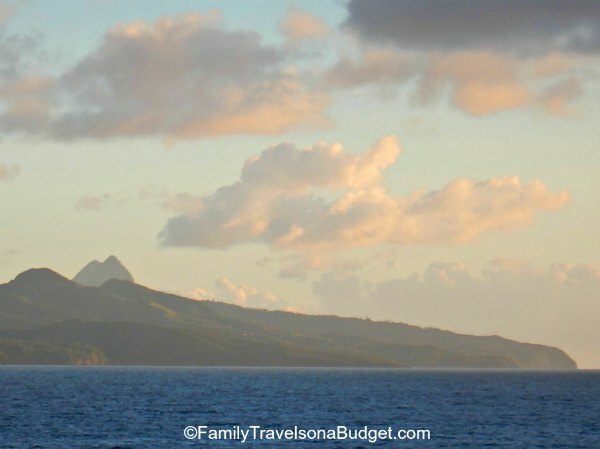 Of course the highlight of the trip, for me, was seeing the Pitons throughout our journey, including the great views of the Petit Piton from the beach in Soufrière. I took enough photos to fill a book! What about the tragedy? Or my hero? Ahhhh… friends, you’ve read this far… I will not disappoint! We arrived back at the port and headed into the shopping area, surprised to have time to shop. I knew exactly what I wanted, a wire sculpture handmade by a local artist, Paulinus Herman. We headed straight to his booth and I negotiated a cash discount. Rob didn’t have enough cash in his wallet, so I asked him for my camera bag where I had a few extra dollars tucked away. He didn’t have it. And then I knew… I’d left it under my seat on the van. PANIC! I made a mad dash to the parking area, but James was long gone. More panic! The St. Lucia taxi service (which I HIGHLY recommend) has a stand at the parking lot. Many cabbies were sitting there, chatting after work. They recognized my fear and immediately asked what was wrong. I asked after James. They all knew him and told me where he usually hangs out, just beyond the taxi lot. I ran there. At this point, I was both sad and mad. Sad that all my photos of my wonderful day and cherished Pitons moment were gone. Sad that I had “ruined” a beautiful day with my forgetfulness (and no, not from too much rum punch). Mad at losing more than $1,000 worth of camera and equipment — a treasured gift from my husband. Mad at myself for being forgetful. And still… panicked. I returned to the taxi stand not knowing what else to do. Enter the hero (or in this case heroes)! The cab drivers pulled out their phones to call and text James. They left voicemails and messages. Two of them jumped into their vans and charged off, my knights in shining armor, searching his regular hangouts. They assured me again and again that they’d find James and my camera before I had to board the ship. I sat, quietly… My insides were churning. I fought back tears. I apologized to Rob a million times. Deflated. 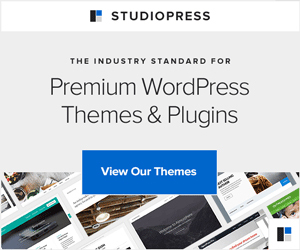 Time ticked…. we had about 15 minutes left before we had to be back on the ship. And then…. cab driver number one pulled into the lot, yelling out his window, “We found him. He’s on his way!” A huge grin spread across his kind face, and I began to cry again, this time relief. The second cab driver came in a moment later also shouting the good news. And I waited… precious moments ticked by. Then woosh! James pulled into the lot, right up to the taxi stand, my camera bag sitting by his side. He handed it to me, and yep, I began to cry. Again! James is a big man, a businessman, pleasant but not quite warm and cuddly. He shifted into park, got out and came around the front. He gave me a big bear hug and chided me for crying (not for forgetting my bag). He told me to go enjoy my vacation. And then he was gone. I thanked the cab drivers over and over, but they said that’s just what St. Lucians do. Relieved, I headed toward the ship. The wire sculpture artist was still there, waiting for me. In seconds I made my purchase and headed to the ship. All with three minutes to spare, thanks to my heroes in St. Lucia! 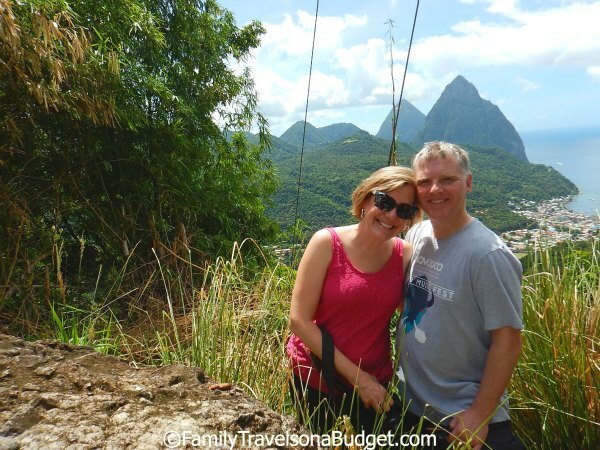 We took the St. Lucia Land Tour, but there are several options (including the new private family tour), which costs $70 USD/adult as of 2016. Each tour has its own rate. The order of this excursion may change. The tour stops at various points for views and photos. The swimming location may change due to weather and sea conditions. Complimentary refreshments will be served from coolers. Vehicles are air conditioned and comfortable! Wear water shoes — especially for the beach and waterfall. Remember to check under your seat after the tour! YAY!!! I hope you get to go. So far, it’s my favorite Caribbean island! Rum punch and people — so fabulous! What a great story! James truly is a hero, and so are all his friends who helped you out! Lucky you got the camera back before your ship left. One of the best vacations I’ve ever had was to St. Lucia where we rented an open-air home with a view of the Pitons. I climbed Gros Piton on that trip and it was a memory I will cherish forever. It’s a beautiful country! I am totally and completely jealous! I hope I can go back in the next couple of years to take your vacation! I could spend a lot of time in St. Lucia. I saw St Lucia on a cruise with a friend about 20 years ago and have been wanting to go back ever since. It is so lush and beautiful. Your story about your camera choked me up. I can imagine how I’d feel and the let down after such a perfect day. I’m so glad it had a happy ending! AWWW. Great story and so glad it had a happy ending. 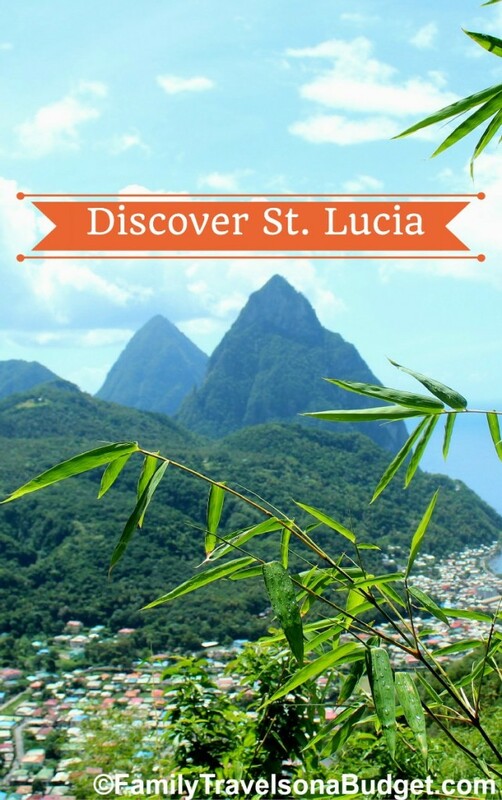 St. Lucia is definitively on my bucket list! Looking forward to going there some day! I saw that coming as soon as you mentioned grabbing your ‘real camera’. I’m SO glad this story had a happy ending! And I’d have cried, too. Also, I love your final bullet point under Know Before You Go. Ha! That final bullet point will go on every tour recommendation I ever write again! UGH! 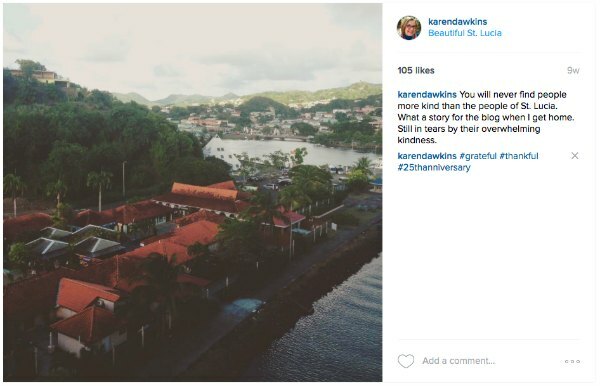 Wow, one impressive story about your travels in St Lucia. I loved the drama bit, I would be crying too, can’t blame you there. Incredibly lucky those drivers were so nice. A place to consider for my future travels. Inspiring.